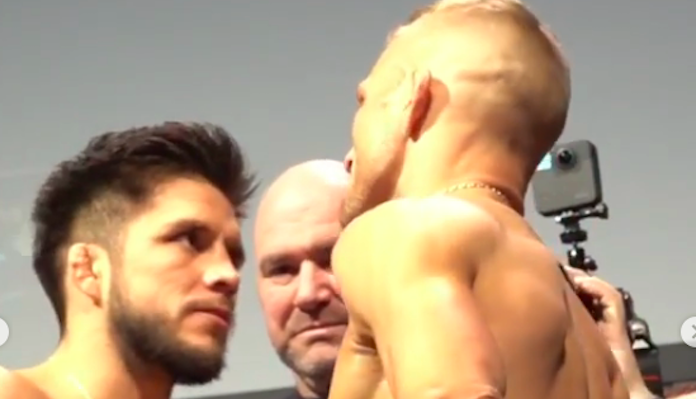 Speaking to the media backstage amid the UFC 236 festivities over the weekend, UFC flyweight champ Henry Cejudo divulged that he received warnings about his last opponent TJ Dillashaw’s performance enhancing drug use. TJ Dillashaw tested positive for EPO, an injectable only performance-enhancer, shortly after his 32-second TKO loss to Henry Cejudo. Understandably, Cejudo no longer holds his opponent in high regard as a result. “He didn’t touch my face, nothing happened on my part, but maybe some other people were victims to his wrath,” he said. “But that’s for USADA and the UFC to research everything. “I’ll never fight him again,” he added. “And it’s not because I’m scared. I shook his hand. This is a sport, this isn’t baseball. You’re not hitting a baseball, it’s another human being. I want no part of him. Doesn’t matter what they’re going to offer me or what they’re going to give me, in my eyes, TJ, there was bad intentions in there. There’s no desire for me to want the fight. I’ve always been drug free. What do you make of these comments from Henry Cejudo? This article first appeared on BJPENN.COM on 4/15/2019.